Welcome to the most advanced and practical waterproof floating floors available in Sydney Australia ®. Aquastep® is the latest innovation in Laminate Flooring. 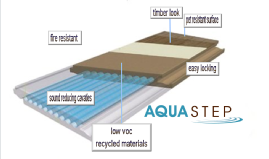 Aquastep’s unique waterproof and acoustic properties eliminate water, moisture and sound problems of typical wood floor, floating floorboards, laminate floors and floating floors. AquaStep is 100% Waterproof and with the highest commercial fire rating, Aquastep® is also quiet, eco friendly and VOC free. Aquastep is available in a range of 15 modern colours and styles to suit your home at Sydney and across Australia. Sound deadening materials and an inbuilt sound cavity make Aquastep® the quietest hard flooring available today at Sydney and across Australia. Depending upon the underlay selected, Aquastep can achieve significant sound reductions ranging from 20 db to 30 db. You need to know the acoustic limitations of your block to determine whether you or not you will need upgraded underlay. Aquastep will always meet the Building Code of Australia using regular Dunlop underlay. Aquastep® is the easy clean solution for a busy kitchen floors. You can use a damp or wet mop with Aquastep. Just add a neutral cleaner to your water. Most cleaners are harsh and unsuitable for anything other than cold tiles. We recommend using natural cleaners which can be purchased at most supermarkets. 15 Colours to suit all decors. Aquastep’s® unique construction prevents water damage, warping, deforming and swelling due to moisture at Sydney and across Australia. Aquastep is made from recycled plastics, woods and stone, combining to create a waterproof flooring suitable for kitchen floors, lounge rooms, dining rooms, bedrooms, and laundries. Depending upon drain positions, Aquastep may not be suitable for some bathroom applications due to drainage locations. Check with your stockist if it will work for you. Aquastep can be installed as a floating floors or it can be directly adhered to your sub floor. No problems with a green slab. You won’t have to wait 3 months for your slab to dry when you use Aquastep. It’s easy to install for budding DIY builders. Packed in cartons weighing 26kg, Aquastep is also easy to physically manage. Aquastep based at Bondi Junction Sydney, is 100% waterproof, and is designed to withstand effects from water damage that would generally affect timber or laminate flooring . Unattended leaks or flooding leading to aquastep sitting in moisture for a period greater than 60 days, may lead to skin delamination and is not covered by the warranty as a manufacturing defect .